Is a writer, translator and stage director. 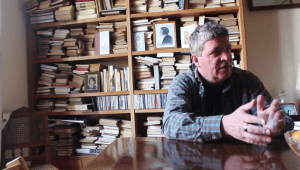 He has published the poetry books O nada (1991), A saco (1999), Tres (2001), LLVM (2007), Comedia (2008) and Nuevos (2013), the dramatic texts La sopla (1998), Dramatic and others Pieces (2002), Lives of Many (2003), 1714. Tribute to Sarajevo (2004), Real Time (2007, in French translation 2008, in German translation 2010), Odola (2007), two of two (2008), A another Wittgenstein or The Holocaust. Zwdu or The doubt / Le doute / Der Zweifel. Farsa (2009), The game or cocktail of prawns (2009), Orpheus and Eurydice. Achilles or the stupor. A History of Catalonia (2012) and The Rings of Saturn (2014), the novels Wings of Wax (1996), La ella de Mileto (1998), The Third Person (2001), Perpetual Peace (2006), The Colors of the days (2012) and the novel by Albert Puig (2016), the storybooks Vidas de tantos (2000), El cuento de la lago. Myths and legends of the Huave Indians (2000) and El instante (2015), and the essays History and tragedy: on the subject of the Jewish Catalans (2007) and Brief essay on death and beauty (2013). He has premiered the operas La pequeña sopla (1995), 1714. Mundo deguerres (2004) and Orfeo and Eurídice (2011), the cantafaula La leche del paraíso (1996), the dramatic ballet Aquiles or the stupor (2015), the poetic actions Comedy (1998) and Paradise (2003), the spectacles opsis (2001) and Salto al vacío (2003), the works Dramático (2002), Vidas de tantos (2003), Queue for the Report for an academy (2004), Stories are o The cabaret of the dead (2004), Real time (2007), two of two (2008), another Wittgenstein, please, or The holocaust (2009), Zwdu (2009), the game or cocktail of prawns ( 2013), Achilles or the stupor (2015), Farsa (2016), and the concert-recital the Orpheus trail (2002). He has collaborated with the groups Zootrop, la Fura and OOFF Company. He directed Do’m de E. Casasses (2003), Report for an academy by Franz Kafka with tail by Albert Mestres (2004), In the shadow of the hollow by JM Synge (2006), High-heeled shoes (2008) by Manuel Molins, Winter cries frost on the geranium (2008) by Agustí Bartra, Another Wittgenstein, please, or The Holocaust (2009), Zwdu (2009), the Anselm Turmeda donkey dispute (2009), Bare feet under the moon of August by Joan Cavallé (2011), Orfeo and Eurídice (2011), Nix tu, Simona by Albert Pijuan (2011), Señor Sapo Señora Muerte (2012) by Josep Sebastià Pons, Helena by Yannis Ritsos (2013), Suite sopla by Joan Brossa and JM Mestres Quadreny (2014), Achilles or the stupor (2015), Farsa (2016), has made the artistic direction of the opera 1714. Mundo de guerras (2004) and has co-directed Sata-Suite Bufa-na de J. Brossa and JM Mestres Quadreny (2002). He has translated the Marquis de Sade, Villiers de L’Isle-Adam, Marcial, T. Landolfi, C. Nodier, G. Steiner, F. Pessoa, A. Baricco, J. Worms, D. Edwards, J.P. Sartre, J. M. Synge, Th. De Quincey, J. Racine, J. Ford, P. Aretino, S.T. Colridge and G. Polet. He has published essay articles in magazines such as El Contemporáneo, Asuntos y Ideas and in newspapers such as Avui. He has participated in various conferences and seminars. He is currently a professor at the Theater Institute of Barcelona.